Matteo Renzi. Flickr/Palazzo Chigi. Some rights reserved. Whatever the result of the January 25 elections the surge in support for Syriza will force open divisions within Italy’s social democratic government. The country’s premier Matteo Renzi has been frequently compared to Tsipras – as another young and nominally ‘left’ leader – but key differences, particularly regarding state investment and job creation, will now take centre-stage. In reality the two have been in conflict for some time, with the former accusing the Greek party of “living in the past” and the latter of dealing in “Merkel’s medicine”. This is no mere bickering but a significant battle in the fate of a left that has failed to distinguish itself from the neoliberal consensus. If Syriza do win next week, Renzi will be placed under pressure from all sides. Many members of the Partito Democratico have been dissatisfied with his leadership (particularly the controversial Jobs Act) and some have given explicit support to Tsipras’s program. Added to this, the electoral list L’altra Europa con Tsipras, which won Syriza an Italian seat in last year’s European elections, demonstrated that much of the PD’s base – and especially young supporters – are critical of Renzi’s relationship with the Troika. This puts the Italian Premier in an impossible position. 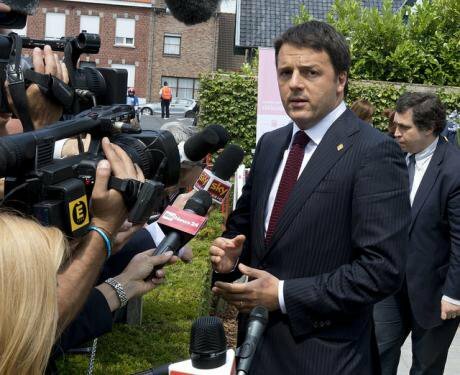 If Renzi supports Syriza in Europe he will anger the EU elite and supposedly jeopardise the neoliberal recovery plan. If, however, he explicitly criticizes them, his own party is likely to fracture and the plan will be compromised at a domestic level. Most likely he will attempt to avoid the issue altogether, as he has to this point. If Syriza win enough votes to govern with confidence, however, this will not be an option. There is another factor in the Greco-Italian relationship that makes these questions particularly important. The Italian economy is one of the largest and most fragile in Europe (a combination which led Mario Monti to label it in 2012 as ‘the detonator of the Eurozone’). In the recent ECB stress test nine of the country’s banks failed. The message is clear. Despite claims to the contrary by Italian Economy Minister Pier Carlo Padoan, any major instability, such as that which would apparently arise in the case of a major Syriza victory, would trigger a chain reaction among these very banks. This is a doomsday scenario, say some, but the threat of contagion will determine how the Italian dialogue plays out in the next months. It is unlikely to work in Tsipras’s favour.